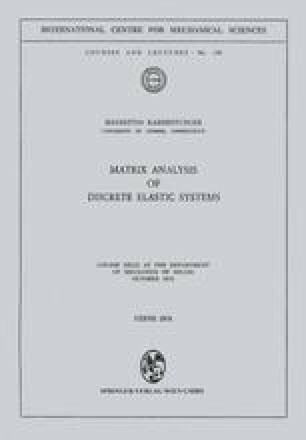 The analysis of elastic systems is done for the purpose of determining whether or not stresses and deflections developed throughout the body meet certain requirements. Such requirements are referred to as the design criteria. If safe and economical designs can be achieved by means other than the analysis, there would not be any need for their analysis. At the end of the first analysis, it is quite likely to be found out that certain portions of the system are either too weak or too strong. This in turn necessitates the modification, i.e., changing properties of the elements, and the reanalysis of the system. Sometimes, modification of member sizes alone may not be sufficient to achieve the optimum design. Changing the boundary conditions, adding or deleting members, modifying the geometry of the system may all be needed. All of these require the reanalysis of the structure.